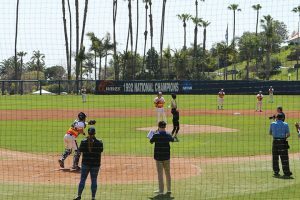 Pepperdine discontinued its football program in 1961, but that didn’t stop the university’s Law and Sports Administration programs from collaborating to bring a big name in the football world to campus — a big name who also happens to be an accomplished lawyer. 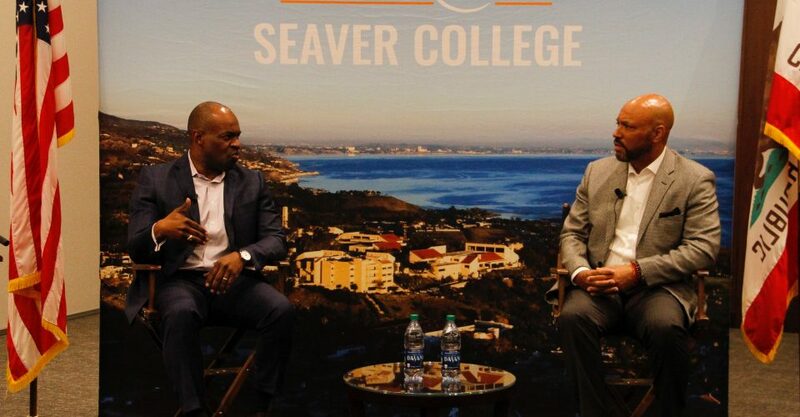 DeMaurice “De” Smith, the Executive Director of the National Football League Player’s Association (NFLPA), spoke for nearly an hour March 21 at an event at the Caruso Auditorium at the Pepperdine School of Law. Smith had quite a bit to say about advocacy and activism, discussing the NFL’s national anthem controversy, his legal adversary Roger Goodell, the NBA and even marijuana. Smith, a former assistant United States attorney in the District of Columbia, spoke with Trotter initially about the limits and challenges of representing “2,000 of the kindest, gentlest people you’ve ever met” (sarcasm intended). “I think the cost of this job to a certain extent is you have to create a public persona that is in the best interest of your players even though it might not be who you are,” Smith said. 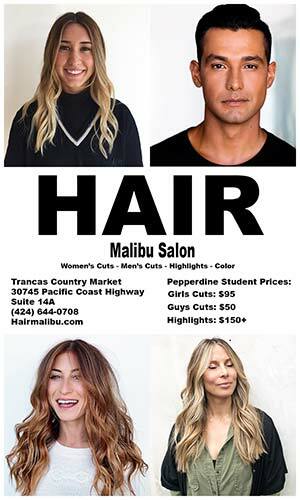 Drawing a line between activism and advocacy because activism does not contain the same “fiduciary obligations,” Smith explained that a group of players fighting for leverage with 31 owners, most of whom are billionaires, was not always easy. As the leader of the NFLPA, which is essentially a labor union, Smith certainly did not apologize for defending the players that he represents. For example, in the case of the national anthem kneeling controversy, not all players held the same opinion, but the NFLPA still reached a standstill agreement with the NFL in which the league did not enforce a rule for players to stand and the union did not pursue a lawsuit on First Amendment grounds. The union chose to look past criticism from the sports media community and potential loss of sponsors when choosing to advocate for the players’ right to kneel. “If the litmus test is going to be that we need to care to the economic interest in order to preserve the economic health of the game, I think I can come up with a lot of examples, where if men and women had not made the right choice, to say ‘we don’t care about a sponsor,’ I think that we wouldn’t have been writing what I still believe is the moral arc in this country towards good,” Smith said. Additionally, when asked by an audience member about the NFLPA’s consideration of President Trump‘s comments criticizing NFL players for protesting during the anthem, Smith stood firmly. Ultimately, Smith said he is proud of the fact that the National Football League does not require its players to stand for the anthem, unlike the National Basketball Association, which is considered “to be more social justice friendly” but also had no players kneel. After about 25 minutes of discussion with Trotter, Smith fielded questions from the audience, some of which focused on the possibility of an NFL player strike in 2021, when the current Collective Bargaining Agreement between the league and NFLPA (which was initially negotiated by Smith) expires. “Our players either need to make a decision that they’re going to approach the situation as a group of unified men, or they won’t,” Smith said. Referencing the success of the 1994 Major League Baseball player strike, which forced the first cancellation of the World Series since 1904, Smith challenged the players to decide what was important to them. To the playful dismay of the crowd in the auditorium, Smith would not disclose the things that the players might be willing to strike and lose a year of playing football over. However, when asked about NFL commissioner Roger Goodell, Smith was not shy about criticizing Goodell, stating that Goodell simply “should not be involved” in many of the disciplinary decisions that are delivered to players by the league. “With respect to player discipline and a lot of other things that [Goodell], over the years, has done himself no favors,” Smith said. Finally, when asked about the differences in negotiation strategy from his job as a lawyer to his role with the NFLPA, Smith was candid in saying that he cared more about player interests than legal debates. “While using marijuana might have a medicinal benefit in some cases, I care more about how do we avoid putting the players in a situation where they need it in the first place?” Smith said. With help from the audience, Smith covered a wide range of topics during the event, yet also made his point about zealous advocacy clear: sometimes, done the right way, it is necessary. Sport Administration Prof. Alicia Jessop, Media Law Prof. Courtney Lang and Director of Pepperdine’s Entertainment, Media and Sports Dispute Resolution Project Maureen Weston worked together to organize the event. Jessop and Pepperdine University President-elect Jim Gash thanked Seaver College for funding the event.